coffee mugs | Yardsaling to Adventure! It’s a very cute idea with one teensy, tiny design flaw…one that Grandma is bound to find the first time she tries to jam that thing into a standard-issue cup holder. My dad had a mug just like that (minus the part about grandma). It had grippy rubber on the bottom and was meant to sit on the dashboard. I think maybe cars up until the ’80s or ’90s didn’t have cupholders as standard equipment. Just imagine if your dentist had a stack of these by the coffee machine in the waiting room. New York is different from California. This may come as a surprise to those of you who have only lived on one coast or the other, or (God forbid) any readers who got stuck living in-between (I’ve driven through your states twice now; I’m so sorry). They’re both big states, with lots of…trees…and they’ve both made me realize that I should look out the window more and see what they’ve got besides trees. But certain things feel like they’re a step away in a random direction; even the yard sales. This past Saturday in New York, I overheard a guy talking about how he (his company?) recently had to pay a $200 million fine, in the same regretful tone that one might remark that they left their phone charger on the bus. “Aw gee,” I could imagine him shrugging, then giving the propeller on his beanie cap a twirl. “What a boo-boo I just did.” (And we don’t even live in the rich part of New York. We live in the cow part.) In Humboldt County—our home in California before moving back east—the only time you’d hear the word “million” was if someone was breaking the record for number of buds grown in a single field. 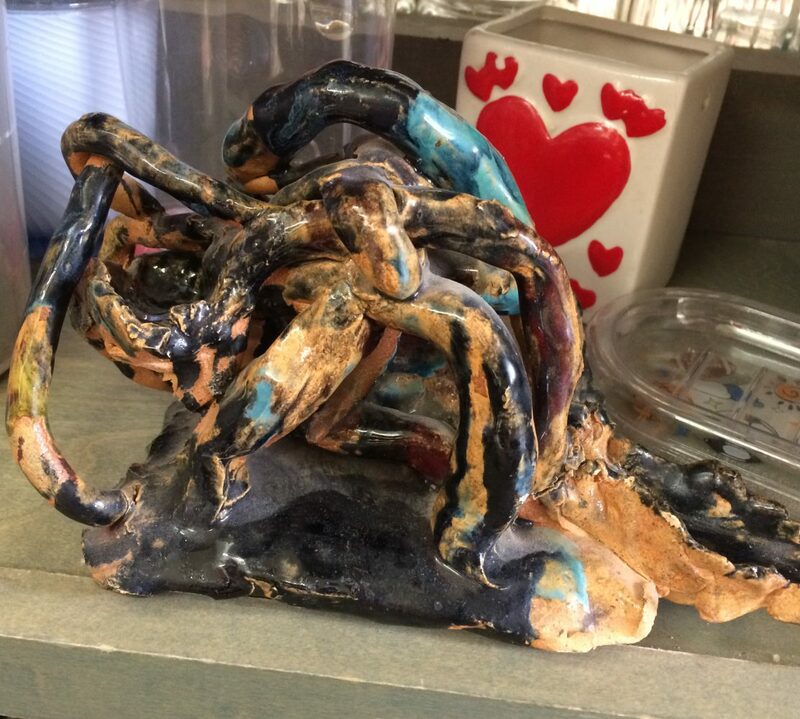 Someone was trying really hard to make something cool in pottery class. …To be fair, it’s not like I could’ve done any better. I wasted entire days in art class “trying to come up with an idea” so I wouldn’t have to actually art anything. I think I only passed because my teacher knew my mom. Wanna help “Yardsaling to Adventure!” grow? Do your Amazon shopping through our affiliate link!